Dear tempted believers: grace, mercy, and peace to you from God the Father and our Lord and Saviour Jesus Christ. Amen. Our Gospel lesson tells us of a powerful battle between two opposites: the Son of God and the devil; the Prince of Life and the prince of this world. One is the Author and founder of life and truth, the other the author and founder of lies and death, and all unhappiness. Jesus, the author of life and truth, desires only everything that is for your good. Satan, the author of death and lies, desires only everything that is harmful for you. The question is, to whom will you listen? Jesus speaks to you in His Word. To learn what is for your good, read the Bible. When the devil tempts you through the world and the flesh, you can do no better than to fight back with the Word of God. That’s what Jesus did. He is God in the flesh and He fought the devil by quoting holy Scripture. Do you think you have a better weapon against the devil? Do you think you are wiser than Jesus and can fight temptation better than Him? Then don’t rely on your own wisdom and use the same weapon against the devil that Jesus used. The devil attacks you with temptations of the flesh. He promises to give you what God won’t. He promises that what he gives you is better than what God gives you. Our bodies need to be fed. We need to make a living. Money doesn’t grow on trees. We need to work, save, invest, and secure our future. If we won’t, who will? But the Bible says that we do not live by bread alone but by every word that proceeds from the mouth of God. We need God’s Word more than we need to make money. We need God’s Word more than we need to provide for our bodily needs. Jesus teaches us to pray seven petitions in the Lord’s Prayer. Six of the seven pray for spiritual benefits. Only one out of seven pertains to bodily needs. The devil attacks us by temptations of the world. He told the Son of God to throw Himself off the pinnacle of the temple, appealing to the promise of the Bible that God’s angels would keep Him safe. But to believe the Bible is not to put God to the test. God is in charge. We are not. The religions spawned by the world don’t acknowledge this. They insist that we are in charge of God. Do this and then God will do that. Here’s the formula. Follow it, and see if God won’t bless you! Here are the instructions. Do what they say and God won’t be able to deny you. Leap out in faith and surely God will catch you! Ah, but faith is no leap. Faith doesn’t test God. Faith requires from God no display of power and might that will impress the world. Jesus did not throw Himself down. 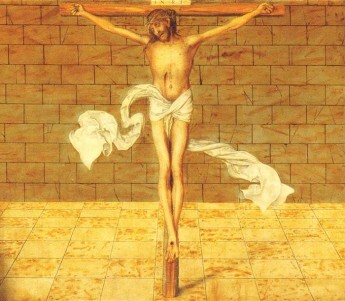 He meekly permitted Himself to be lifted up and there on the cross He draws us to Himself. There, where the world turns away in horror and disgust, Jesus bears our sins and keeps the promise God gave us. The Word of God is our defence against Satan. Guess what that means? Where do you think the devil does not want you to be? In a church where you hear the Word of God in its truth and purity. What does he not want you to read when you’re at home? The Bible. Guess what he does not want you to memorize? Passages of holy Scripture. He wants you disarmed so that you will be defenseless and hopeless and helpless when he comes with his alluring promises and temptations. He wants you to flee to your thoughts and feelings when temptations of world and flesh abound. If you are going to go to church, the devil wants you to go to one that does not cling to every word that comes out of the mouth of God. He wants you to ask, “Did God really say?” He wants to convince you that every doctrine taught in the Bible isn’t so important. It is silly to strictly go by what the Bible says. A church is a church. Choose one that strikes your fancy. It doesn’t matter where you go along as you go. So the devil wants you to believe. But that’s not true. It matters very much where you go to church. If you attend a church that promotes error you will learn error. You may begin to trust in it, rely upon it, be misled by it, and suffer spiritual harm. False teaching hurts you. It is very bad for you. “It is written,” Jesus says. “Man shall not live by bread alone but by every word that comes from the mouth of God.” Every word! Go to church faithfully and go to an orthodox church, that is, a church that teaches God’s Word rightly. If you go to a heterodox church, that is, a church that teaches differently than the Bible teaches, you may be damaged. False doctrine poisons the soul. Jesus said that God sanctifies us in His truth. False teaching sanctifies no one. If a church denies that God gives us forgiveness of sins and eternal life in Christ’s sacraments, it is a heterodox church. It teaches differently than the Bible teaches. If a church teaches that Adam and Eve may have never existed, and that the Bible contains errors on matters of history, and that what the Bible says about women not preaching in the church doesn’t apply today, and that what the Bible says about homosexual conduct doesn’t apply today, it is a heterodox church. It teaches differently than the Bible teaches. If a church teaches that your good works help get you to heaven, it is a heterodox church. It teaches differently than the Bible teaches. Heterodoxy hurts you. We don’t preach against heterodoxy because we hate those who suffer under it. It is because we love them. God wants us to live on every word that comes from his mouth. It is love that holds to the truth. The devil is the author of all false teachings. He even quotes God’s Word as he did when tempting Jesus. But he twists it. He misapplies it. He misinterprets it. Then he promises you something better than what God has given you. Jesus did not fall into temptation. He fought the devil with the Word of God and He won. Jesus overcame the evil one. Adam and Eve, our first parents, were not able. We are not able. It took Jesus to overcome Satan. Death is how Satan tried to defeat Jesus, but it was by His death through which Jesus defeated Satan. In His death, Jesus took all our sins upon Himself. As He took our place under temptation, so He took our place under judgment and punishment. He was judged and punished for our sins. He suffered and died for every temptation into which we have fallen. He died for every time we have listened to the voice of the devil, followed the desires of the world, or given in to our sinful flesh. Jesus died to defeat our enemy, Satan, and render him powerless against us.